So I’ve brought up both of my children up to be individuals. To celebrate that everyone is different. To understand that being unique is something to take pride in. My son is very different to most 10 year old boys. Not because he has Aspergers Syndrome or Autistic Spectrum Disorder … he really is quite eccentric. His conversations about previous and current Cartoon Network logos and TV idents are long and detailed. His knowledge of the London Underground system and its trains is, well, very deep. His ability to make live action and stop-frame films, animate cartoons, code games and sound edit music and SFX using professional levels of software is really quite astounding. All these things we celebrate. But as he gets older, the one visible thing we’re finding harder to cheer on is his love of hats. He started collecting hats about 5 or so years ago, moving from dressing up in toy policeman’s helmets to various kinds of caps, sailor’s berets, dress uniform and professional headgear. 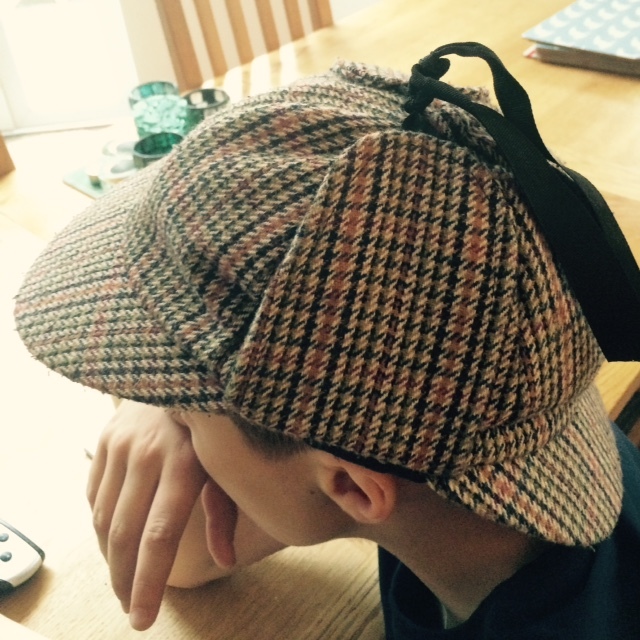 The pride of his collection – the one he spent his birthday money on last year – is a Deerstalker Hat, known more commonly as a ‘Sherlock Holmes’ hat. This hat (using my amateur psycho-analysis) defines him: he is calm, cool and intelligent when he wears The Hat. He is someone Important. Someone who is finding out about the world through logic and thorough examination. So he wears The Hat every day. Every single day. Even in the blazing sun. Even when the rest of him is incongruously dressed in smart school uniform. He’s had many comments of course – ‘Hello Sherlock!’ – “Love the hat!” – ‘Where’s Dr Watson?’ – from well-meaning passers-by, teachers and school fellows. But he bears it all quite amicably. And as he goes to a small (fairly) friendly church school, he has been accepted as a unique boy with a love of hats. His hats were even mentioned in the school award he won, and in his end of year report. But now things have to change. I hate myself, but I have begun to ban The Hat. To make him change. To make him ‘look like the others’. To ensure he ‘doesn’t stand out’ from the crowd. Because he is undergoing what they call Transition to Secondary School. Although a very young 10, the school system in the UK means he has to go to ‘big’ school after this summer. I’ve been liaising with his current Junior School and his new school to help him move up without too much anxiety, as he has had a few problems in the past. I’d already been thinking about this. And I felt he needed to be protected from a world that might not be so kind to him as the one he’s been used to. So I’ve lied to him. I’ve told him The Hat is not school uniform, and he will not be allowed to wear it when he moves up to Secondary School. Years and years of careful parenting about celebrating difference and staying true to yourself. Dumped because of a Sherlock Holmes Hat. You might not agree with my decision. But I know how cruel children can be. 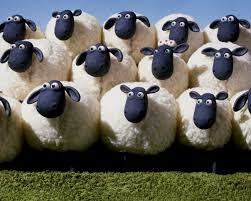 How easy to is to pick out the vulnerable one in the crowd. To hound and harry until they get the reaction they want. As the SENco said, there is a small gap between being liked and admired for your individuality, and being looked down on and cut out from friendships for being a ‘weirdo’. In the meantime I am still saying no Hat to my boy. I’m hoping he’ll understand one day that I would never want to take away part of his brilliant and endearing personality: I was only trying to protect him. Still. I hate myself for it. Wow. Tricky, especially as he is one of the few people a deerstalker actually becomes! But I totally see your point. This age is hard. The tribalism can be vicious. From the little I know of your son, he will always find a way to be himself. It does sound, though, like he may struggle to negotiate pre-teen “politics” more than some. It sounds like you might be teaching a lesson in belonging (which at 10-13 is remarkably like conforming), so that some day he can *choose* how much he wants to belong. It’s not a choice if you’re always excluded a priori from the group. I enjoyed this post — your genuineness and your intentions — so very much! As a speech-language pathologist who focuses on social communication skills with my students, I, too, walk the clashing line between acceptance of oneself and protection against the cruelty of the Others. Thank you for sharing your story. Thank you so much Kim! Unique people do indeed tread a narrow and judgmental path in this world.